Good morning. My name is Ivan. 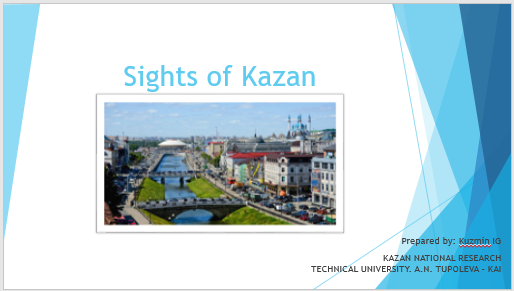 I’m full-time student of Kazan National Research Technical University. Today I would like to talk with you about sights of Kazan. First, I would like to talk about Kazan Kremlin. The Kazan Kremlin is the oldest part of Kazan, a complex of archaeological monuments, revealing the long history of the city. 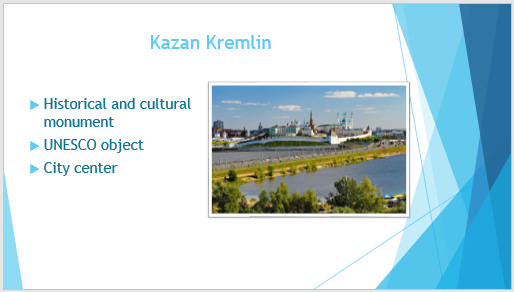 Also, KK is an object of UNESCO. This structure stands on the Shenkman street, next to river Kazanka. 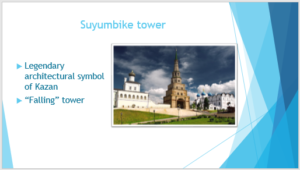 Let’s talk about Syuyumbike tower. The Syuyumbike tower refers to the “falling” towers. Its seven-storey leaning tower, the legendary architectural symbol of Kazan. This structure stands on Shenkman street, inside the Kazan Kremlin. 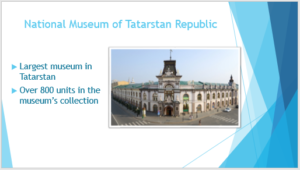 The National museum of Tatarstan Republic is the leading museum center of Tatarstan and one of the largest cultural and historical museum in the Volga region. There are over 800 thousand units in the museums collection. 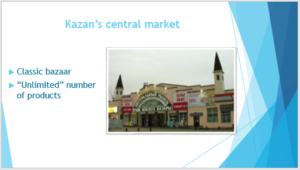 Its on the corner of Shenkman and May 1st Square street or across the street from the Kazan Kremlin. Сочинение на английском языке на тему «Достопримечательности Москвы»/ «Places of interest in Moscow» с переводом на русский язык.